What gives Vermont Teddy Bears their distinctive poochie bellies? At first blush, you might guess that the furry fellows indulge a bit too frequently in another made-in-Vermont product: Ben & Jerry's ice cream. A visit to the Vermont Teddy Bear factory in Shelburne, Vermont, will assure you, though, that it's just old-fashioned stuffing that gives these guys their portly physiques. The stuffing is blasted into them at 100 miles per hour--not even a teenager whose heart's been stomped by her first love can down Ben & Jerry's that fast! The speed at which stuffing travels is just one of the "bear essentials" you'll learn on a tour of the place where bears are born. Visitors to the Vermont Teddy Bear factory see the entire bear-making process. It's hard to believe that those adorable, cuddly bundles known as Vermont Teddy Bears begin simply as giant sheets of furry fabric. Each bear gets plenty of hands-on attention, from sewing to stuffing to brushing and fluffing. You'll hear interesting tidbits about how they come to life, punctuated with Vermont humor that makes the tour entertaining for adults. Every Vermont Teddy Bear comes with an unconditional lifetime guarantee. Any "injured" bear can be admitted to the Vermont Teddy Bear Hospital, where it will be repaired (or replaced in the event of a serious tragedy!) at no charge. Vermont Teddy Bear is the brainchild of John Sortino, who made his first bears in his wife's sewing room in 1983 and sold them from a peddler's cart at an open-air market in Burlington, Vermont. The company really took off in 1990 when the Bear-Gram concept was launched with an aggressive, pre-Valentine's Day advertising campaign touting bears as a fun and lasting alternative to flowers. 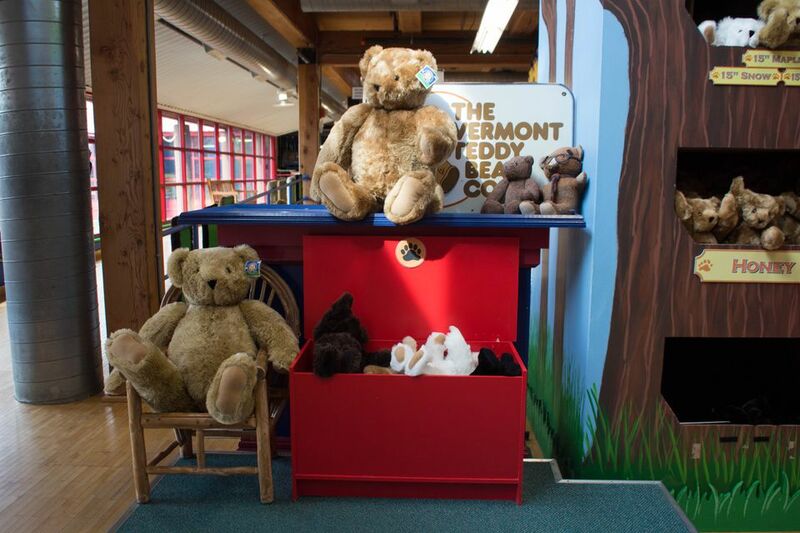 Today, Vermont Teddy Bear is a public company that employs more than 160 people and sells more than 150,000 bears each year. Each made-in-Vermont teddy bear has its own attitude and personality. There are more than 100 unique designs, all available for overnight delivery to anyone who could use a bear boost. Pregnant bears, angel bears, career bears, golfer bears, superhero bears--the designs meet just about every gift-giving need. There are 3-, 4- and 6-foot tall Big Bears for kids and adults who'd love a cuddle buddy. There's even a birthday suit bear, whose removable bear fur might make you blush! The Vermont Teddy Bear Factory is a great place to take the kids, but be forewarned that the chances of getting them out of the factory without new bear buddies from the Bear Shop in their arms are slim to none, especially when they see that they can design and stuff their very own bears. Here's your guide to visiting Vermont Teddy Bear, or, if you can't get to Vermont, send a Bear-Gram to someone you love--like you! Hours: The Vermont Teddy Bear factory and the Bear Shop are open daily except for Easter, Thanksgiving, Christmas and New Year's Day. The Bear Shop is open from 10 a.m. to 4 p.m. with extended hours from 9 a.m. until 6 p.m. in the summer and early fall. Half-hour factory tours are scheduled each day: Arrive early during the busy summer months, when tours often fill up. Weekdays are the best time to visit if you want to see bears in production. Admission: Factory tour admission is $4 for adults, $3 for seniors and free for kids ages 12 and under. Directions: The Vermont Teddy Bear factory is located on Route 7 in Shelburne, Vermont, about 7 miles south of Burlington. From Interstate 89, take exit 13 and proceed south on Route 7 for about 6.5 miles. The factory is on the left. From Interstate 87, take exit 20 and drive east on Route 149. At Fort Ann, New York, take Route 4 East to Fair Haven, Vermont. Proceed north on Route 22A to Vergennes, Vermont. Turn left onto Route 7 and travel north for about 16 miles. The factory will be on your right. Hotels Nearby: Hotels located within 5 miles of Vermont Teddy Bear include the Holiday Inn Express Hotel & Suites in South Burlington. For Group Tour Information: Call 802-985-3001, ext. 1700 for reservations. For More Information: Call 802-985-3001, ext. 1700 or toll-free, 800-829-BEAR.